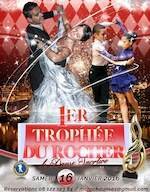 Taking place all afternoon and into the evening, the 1er Trophee du Rocher de Danse Sportive is a competition with around 150 participating couples and space for 500 spectators. Organized by ASM Danse Sportive. For more information phone 06 12 21 23 84, email mcrockdanses[at]gmail.com and visit the organizer's website at: ASM Section Danse Sportive and the facebook group: 1er Trophee du Rocher ASM Danse Sportive.